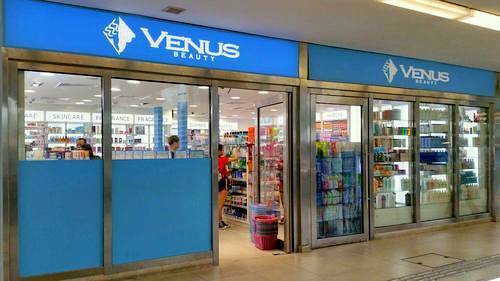 Cosmetics and beauty shop chain Venus Beauty has 22 stores in Singapore, including one at Choa Chu Kang (10 Choa Chu Kang Ave 4). Established in 2002, Venus Beauty is today one of the most trusted personal and household product retailers in Singapore, catering to the needs of individuals and families alike. Each of the company’s stores features a range of more than 5,000 products, including a wide range of imported international brands, some of which are exclusive to Venus Beauty shops. The main categories you can shop for are makeup, skin care products, fragrances, household products, hair care products, oral care products, body care products, health care products, kids & baby care products, professional hair care products, feminine care products, as well as lifestyle products. Exclusive brands include Bioleaf, Bio-T, Botanix, Cameleo, Dermakin, Derma AC +, Eve’s, Feng Xi Tang, Khloris, Mizon, Monsoon, Monsoon Professional, NAT. CHAPT., Natural Source, NERIC+, Neuskin, Pasle, Prestige, S.E.M.P.L.I.C.E., Sense Of Care, Yufit, as well as Selphy. Apart from the wide selection as a one-stop shop operation, Venus Beauty is dedicated to providing the high quality products at great value, at affordable prices. Venus Beauty’s official Facebook brand page is located at www.facebook.com/venusbeautysg. Following the Facebook page, you’ll receive updates about the chain’s latest promotional offers, new items on the shelves, events, and much more. …Theramed, Thursday Plantation, Tidyz, Tiger Balm, TIGI, Toni&Guy, Top, TRESemme, Uniq One, Urbanlife, Uriage, Utena, Vagisil, Vanish, Vaseline, Veet, Venus, Vicks, Victoria’s Secret, Vidal Sassoon, Vitaminstore, Voltaren, Wakodo, Wella, Wella SP, Whisper, White Organia, White Rabbit, Windex, Wong Cheung Wah, Wright’s, Xpel, Yamamoto Kanpo, Yankee, Yufit, Za, Zam-Buk, and Zazie.